The dangers of the Great Barrier Reef come to the surface in the 2010 thriller coming to Blu-ray this July. 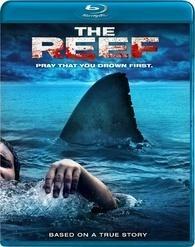 In an early announcement to retailers, Image Entertainment is prepping 'The Reef' for Blu-ray on July 19. A thriller that pits man’s will to live against nature’s relentless urge to feed, Andrea Traucki’s ('Black Water') 'The Reef' was shot in Australia using real sharks and including incredible underwater footage for a pulse-pounding, visually stunning experience. Featuring a young, talented cast, gorgeous scenery and a monster that doesn’t have to rely on science fiction, this is a thriller that never lets go until the final, heart-stopping scream! The Blu-ray will feature 1080p video, a DTS-HD Master Audio 5.1 soundtrack, and supplements will include a making-of featurette and a trailer. You can find the latest specs for 'The Reef' linked from our Blu-ray Release Schedule, where it's indexed under July 19.